In the dark days of Winter when most plants in our gardens are sleeping, it’s still possible to achieve a glorious display of colour with a selection of Winter-interest shrubs that will keep you going until Spring! We’ve selected just a few of our favourites, which not only look great throughout the Winter, they also provide interest throughout the rest of the year too – and as an added bonus they’re also wildlife friendly. The numerous pollinators which remain active during our coldest months such as hoverflies and some bumblebees will be eternally grateful if you plant Winter-flowering shrubs as a nectar source, insects will shelter and rest in the foliage provided by evergreens, and of course berrying shrubs provide nutritious snacks for hungry birds! Shrubs are also extremely useful for providing structure in the form of hedges or as specimens in borders, or you can plant them in pots and containers to give yourself a truly portable display – just be sure to take care to provide the conditions they enjoy and they’ll thrive. 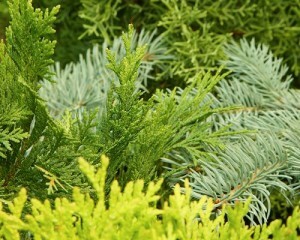 Ranging in size from tiny dwarf varieties to magnificent trees, conifers offer a fabulous variety of colours – shades of grey, blue, yellow, bronze and a multitude of greens, some of which change with the season – that are bound to brighten any garden. 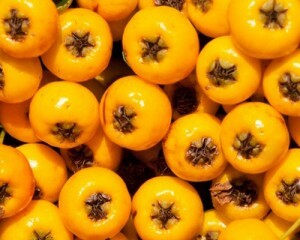 Most are hardy and have a long life expectancy which provides valuable constancy to the structure of the garden, and there are varieties which are happy in most soil types. They’re simple to look after and, once planted, they need no staking or dead-heading and there are no fallen leaves to rake! The plants themselves form fantastic shapes and their leaves provide wonderful texture – and the spreading varieties (like Juniper) can provide excellent ground cover, helping to prevent soil erosion and act as a weed suppressant. All varieties produce lovely seed-bearing cones, although you may find some are more reluctant than others! 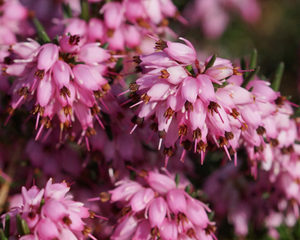 With fantastic foliage and beautiful flowers, heather provide year-round interest and offer a simple solution to keep your garden looking attractive throughout the seasons. When we think about heather, we are almost always thinking about two different plants – heaths and heathers. Both belong to the Ericaceae family, but are botanically different and divided into the Erica (heath) and Callunas (heathers) genuses. In practical terms they are almost identical, sharing growth habits, form and colour – all are evergreen and low maintenance – and they enjoy the same garden conditions which make them easy to look after. There are over 1,100 varieties between the two genuses, and these include plants which flower in all four of our seasons – great for year-round interest. There are lots of flower colours available – white, cerise, purple, lilac and red – and some plants have extra large flowers which provide added impact. Foliage is also a big part of their attraction, offering a range of colours from green and yellow through to bronze and red – and many foliage colours change with the season, so they’ll positively sparkle against the winter hues of brown and tan or white snow! 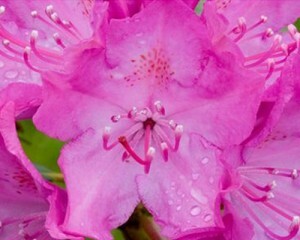 We often get asked about the difference between rhododendron and azalea and, although they were once classified in separate plant groups, they are now all placed in the genus rhododendron because of their many common characteristics. Most of them flower in April-May but there are one or two that bloom early and can certainly help to banish the Winter blues! Be sure to choose one of the earlier flowering varieties, which offer a great range of colour choices – from white, through shades of pink and red to lilac, maroon and purple. One of our favourites is the gorgeous pink-blushed flowers of the evergreen ‘Christmas Cheer’ – all it needs to encourage flowering is a mild spell in January or February – well worth taking a chance with it! With their iconic bright red berries and spiky leaves – and arguably at their best through the Winter – holly surely is the most quintessential British shrub for the Winter garden. Fully hardy, happy in full sun or partial shade and tolerating most soils, these lovely shrubs are usually slow-growers – but the benefit of that is they won’t be quick to out-grow their position! They can be deciduous, but most are evergreen and foliage can vary from solid, glossy dark green to beautifully cream-edged variegated varieties – and although we traditionally think of holly with spiny leaves, there are virtually spineless varieties available too. 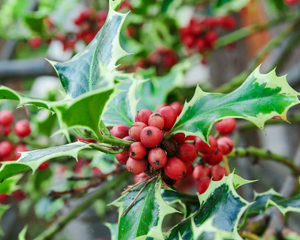 All hollies will flower in Spring, but it is only the female varieties which will produce berries – so be sure to select a self-fertile variety or double your holly delight and also plant a male variety in your garden. These shrubs make excellent specimens or highly effective hedging and are also great for topiary if you’re feeling creative! Sometimes it’s hard to decide which aspect of this glorious shrub it is that really earns it its place in the garden! 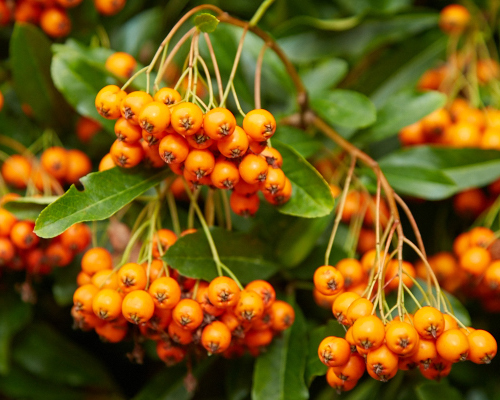 The colourful, showy berries in red, orange or yellow which appear in Autumn and last through the Winter provide great colour and attract hungry birds – but these plants also deliver wonderful frothy, white flowers in late Spring and early Summer which bees and other pollinators love too – and then of course there’s the glossy evergreen foliage which provides structure and additional colour all year round. They’re also hardy, suitable for just about any soil or situation, can be grown free-standing, against a wall or even as a hedge. The only downside could be considered to be the thorns, however these make an excellent security barrier and help to protect nesting birds and sheltering wildlife – but they don’t need much pruning to keep them in shape and, considering everything else that pyracantha delivers, we’re happy to put on our thorn-resistant gloves when required! Inspired to add Winter interest to your garden? Our great range is available in-store NOW, so visit us and choose the cast for your own Winter wonderland!